An interview with Emanuele Vulcano, founder of Infinite Labs located in Milan Italy and creator of the hugely successful iPhone “Mover” app. Emanuele is a self-taught, 23-year-old, application builder and designer. Emanuele describes his path and plans for an app that brought immediate success with more than 20,000 downloads in four days. 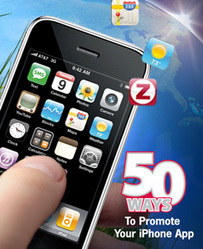 He currently enjoys top rankings in the iPhone App Store and a steady 1,500 downloads per day. How did he achieve such a remarkable level of success that includes TV air-time, compliments of Apple, on a marketing budget of zero? Read on. An interview with Emanuele Vulcano, founder of Infinite Labs located in Milan, Italy and creator of the hugely successful iPhone “Mover” app. Emanuele is a self-taught, 23-year-old, application builder and designer. Emanuele describes his path and plans for an app that brought immediate success with more than 20,000 downloads in four days. He currently enjoys top rankings in the iPhone App Store and a steady 1,500 downloads per day. How did he achieve such a remarkable level of success that includes TV air-time, compliments of Apple, on a marketing budget of zero? Read on. Tim: When did your “Mover” App launch in the iPhone App Store? Mover, my most successful app to date, launched as a free app in the App Store on May 2nd, 2009. Tim: How long did it take to know you had a winner? Public reception was immediate, with strong download numbers of more than ten thousand in three days and reviews on prominent websites such as TUAW.com in the weeks immediately after the launch. Tim: What process did you use to get reviews from prominent websites? Did you fill out online forms or use other methods? For those sites that have a “send a tip” web form, I used that page; otherwise, I searched for a private e-mail address or used a posted in public forums associated with the site where this was not against the rules. Tim: How long was Mover among the top ranked apps? Thanks to Apple featuring the application, the application enjoyed a high number of downloads and a Top 100 position until the week of June 30th. Tim: And how has it performed since? The application fell out of the Top/New charts, and has held steady around 1,500 daily downloads since then. This changed in early August when Apple’s advertisement aired, causing the application to return to pre-June 30th levels and enjoy a return to the charts. As we speak, Mover is the Top 28th free application and the Top 5th free app in the Utility category. Tim: What do you think led to Apple featuring your app in a TV commercial? It’s my opinion that the immediate visual impact, alongside the relative popularity among App Store users, was judged optimal for a TV advertisement where a product has to prove itself in an extremely limited time. The animated sequence involving Mover in the ad is memorable, despite being just one second in length. Tim: You’re located in Milan, Italy…what percent of downloads occur outside of the US? As of early August 2009, 47% of downloads have been outside the US. Tim: What marketing methods have proven to be most effective thus far for you? In descending order of effectiveness: being featured by Apple in the New & Noteworthy section; being featured in the “Share” Apple advertisement; being part of one of App Store’s “top”/”new” lists (Top Free, Top Utilities, “Sort by release date” default view in the Utilities section); the Mover app YouTube video showing my application at work on my website; blog reviews (TUAW.com, 148apps.com…); word-of-mouth. Despite being the lowest in the list, word-of-mouth is probably accounts for most subsequent marketing initiatives being pursued. I should mention that none of these initiatives were paid for by Infinite Labs. My applications have been marketed on a monetary budget of zero, exploiting user satisfaction and free-to-use Internet channels rather than selectively using costly traditional advertising means. As a student on an extremely low monthly budget, I use “costly” to indicate that those means had a cost that was higher than zero and therefore unacceptable to me. Tim: What do you think has helped push you up in the iPhone App Store rankings? The unique, immediately understandable experience; the nonexisting financial barrier to entry (the app is free); the possibility of seeing the app in action without buying it through the website and YouTube video; the novelty of the experience, which prompted users to “show it off”; and the perceived lack of functionality in equivalent areas of iPhone OS when compared with other smartphones convinced a large amount of users to give it a try. The high download numbers did the rest. Tim: To what extent do you think social media has played a role in your app’s success? Word-of-mouth certainly accounts for most of Mover’s success, since it spurred the initiatives that placed Mover near the top of the charts in the last two months. Social media did play the part of an echo chamber for Mover’s strong points, allowing word-of-mouth to spread faster and more effectively. No single channel is responsible for Mover’s success — users of multiple tools that felt strongly enough about the application used them to advise others to try it, but the particular medium used was secondary to this. Tim: What logic did you use to set the app price? Mover was conceived as a proof of concept and a piece of programming “art” or “craft”, alongside being an useful utility, as detailed on my blog. Additionally, the laws of the country I reside in, Italy, prevent me from starting an entrepreneurial activity without undergoing appropriate bureaucracy, which I hadn’t completed at the time. Therefore, without economic consideration to worry about (in fact, being bound by law not to pursue them), I opted to provide the application for free. Additionally, even now that I am free to have an income from this activity, I have in hindsight found that a free version of the application provides a workaround to one of the application’s main weak points — namely, that two or more parties have to own it in order to use it. Therefore, I have decided not to raise the price on the original version of the application and pursue alternate monetization strategies instead. Tim: What do your alternate monetization strategies include? On August 16, 2009, a Tier 2 ($1.99) “Mover Plus” version was launched with often-requested additional features including Bluetooth support, new item kinds (bookmarks and text clippings) and many UI and engine refinements. This will be followed by the release of an ad-supported “Lite” version with equal features. The Lite version would be released as an update to the current free application on the Store. Depending on the performance of any of the two strategies, I will later fine-tune the release strategy with the aim of allowing everyone to enjoy the application with as few barriers as possible, while optimizing the overall gain. For example, if the Plus version performs better than the Lite version, I could add pay-only features, drop advertisements in future Lite releases, or release Plus versions with new features in advance of Lite versions. In the opposite situation, I could evaluate ad strategies, such as using multiple networks (for example, via AdWhirl) or offering nonstandard advertisements (for example, as slides that appear periodically on the table, rather than banners) instead. Tim: Any plans for other device platforms? Although there are contingency plans to port Mover to other platforms, no actual plans have been prepared yet. If Mover were to move, or be offered alongside the iPhone version, Android and Palm webOS would be the preferential choices. Due to the uniqueness and limitations of each platform, having multiple versions of Mover could degrade the user experience due to the potential incompatibilities between those platforms. For example, webOS clients cannot access other Wi-Fi clients, and neither webOS nor Android can access clients over the Bluetooth protocol used by Apple to allow iPhone app communication. Tim: What’s next for your Mover App? I’m working on an initiative to leverage underused iPhone OS 3.0 APIs to allow for easy data sharing between applications, allowing App Store apps to access items (notes, songs, to-dos…) managed by other App Store apps. (The working title for this is “ItemKit” and partial open-source-licensed code can be found on my github.com web page. Mover would exploit this by allowing arbitrary items from other applications using ItemKit to be shared and received seamlessly. There are many other features that are either highly requested or logical extensions of my work. Some of these are listed at the feature triage page [partially outdated — for example, “Mover SDK” became the more generic ItemKit as described above]. Tim: What are your big picture plans, given your success with this app? At the moment, none apart from expanding it to its logical conclusion: monetize it and observe how it is used in the real world. Most of my plans are hampered by my enrollment in the second-level degree course in Computer Science Engineering at Politecnico di Milano, which is my main priority. It is my desire to turn to full-time prêt-à-porter and custom software development once this is achieved. Tim: When is your graduation date? I expect to graduate in or before September, 2010. Tim: What you’ve learned from your iPhone app success story? That a well-crafted object speaks for itself. A paid marketing effort would have probably helped Mover achieve better success; but no amount of money could have saved Mover had it not been designed for usefulness and enjoyment. My sincere thanks to Emanuele for sharing his formula for success. I’ve learned a lot from him and look forward to following his accomplishments. He’s just getting started :). Emanuele Vulcano is known for his great sense of humor as demonstrated in his blog. Be sure to follow him on Twitter, too.